Pay-How-You-Drive « Global Market Insights, Inc. 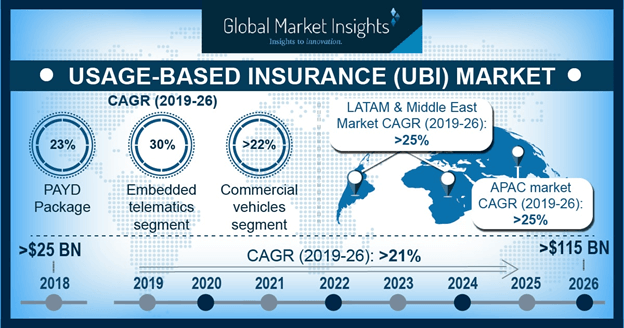 Rising number of automobiles on roads and surging insurance premiums have significantly propelled the global usage-based insurance (UBI) market expansion, in conjunction with rapidly developing supportive technologies. The ability to track aspects such as how a car is driven, behavior of the driver and the amount of distance travelled has enabled insurers to use UBI for predicting premium earnings, while vehicle owners are saving on insurance costs. The usage-based insurance industry has grown leaps and bounds as instruments like dashcams, Blackbox, on-board diagnostic tools and smartphone-based telematics solutions have experienced massive consumption over the last few years. One can easily argue that when the number of cars being driven increases, the probability of accidents also go up, depending on the general area trends. The importance of insurance can be surmised from the fact that in 2017, around 309,000 car accidents occurred in New York state, indicating considerable losses in terms of liability and property. Derived from the alarming frequency of mishaps in New York, the average car insurance rates in state ranged from US$2,428.24 to US$6,540.73 during the year. UBI can help safer drivers in such areas to take advantage of their favorable driving behavior and record to enjoy suitably lower premiums, underscoring the effectiveness of the usage-based insurance market. Commercial insurance has been a major spending area for not only individual truck owners but also for fleet managers, dealerships and for services like taxi or ride-sharing. Fortuitously for the usage-based insurance industry, worldwide estimates suggest there would be tremendous growth in the commercial sector over the next few years, promising a large target segment. Commercial vehicle premiums for trucks could go quite high due to the vehicle’s value as well as greater risk and severity of damages. Although tightened rules regarding driver qualification and safety training have lowered the rate of accidents, trucks still contribute a large number to road-related deaths in North America. According to the Federal Motor Carrier Safety Administration, U.S., nearly 4,440 large trucks and busses had been involved in fatal accidents in 2016, while in total over 475,000 crashes involving large trucks in the year had been reported by the police. Essentially, these numbers represent the enormous amounts of insurance claims that may have been registered during the time, indirectly pushing the overall insurance market premiums higher. The North America usage-based insurance market can garner immense remunerations from commercial vehicle policies, as swelling premiums encourage customers to adopt relevant devices or telematics. Citing a key example showcasing the usage-based insurance market penetration in North America, Intelligent Mechatronic Systems Inc., headquartered in Canada, offers effective UBI solution for commercial lines. Its telematics product helps fleet owners provide insights into the crucial vehicle data, assisting insurers in calculating premiums and retain customers. Such technology improves driver awareness and overall road safety, while insurers are able to know accurate behavior and causes of any accidents that happen. With numerous technology companies and start-ups based out of U.S. and Canada, the North America usage-based insurance industry is expected to witness remarkable growth in the imminent future, accounting for almost 35% of the global share by 2024. A report unveiled by U.S. firm Aite Group suggests that about 2.5 million commercial insurance-related telematics devices were present in cars globally by 2017 end, and this number will reach 120 million by 2021. Fleets are significantly benefited by the usage-based insurance market, as they often consist of half a dozen to hundreds of vehicles. Progressive, one of the biggest motor insurers in the U.S., offers an UBI solution based on electronic logging device (ELD), which shaves of 3% of the premium at the time of signing up itself, and even more later on during the cover period. Consider these savings multiplied for a greater number of vehicles in the fleet, leading to huge improvements for the fleet’s bottom line. All in all, with the continuously growing efforts by insurers to boost the adoption of telematics in commercial vehicles worldwide, the commercial vehicle segment in the global usage-based insurance market is anticipated to grow with a rate of 18% from 2018 to 2024. Allstate, Allianz, Axa, Generalli, Tom Tom, Liberty Mutual, Progressive, Nationwide and IMS are some key players constituting the competitive landscape of the usage-based insurance industry. This entry was posted in Automotive & Transportation and tagged Blackbox, Commercial Vehicle, Device-based, Embedded Telematics, Global Usage-based Insurance Market, OBD-II, Passenger Vehicle, Pay-As-You-Drive, Pay-How-You-Drive, PAYD, PHYD, Smartphone, Telematics-based, UBI Market Growth, UBI Market Share, Usage-based Insurance Market, Usage-based Insurance Market Size.